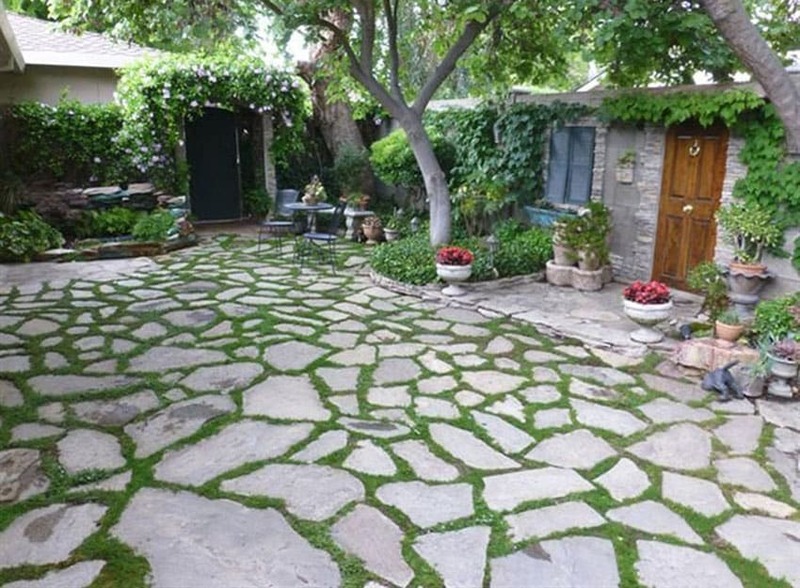 This gallery shares beautiful stone patio ideas for a variety of backyard designs. The type of stone you choose for your backyard will have a big impact on its look and feel. 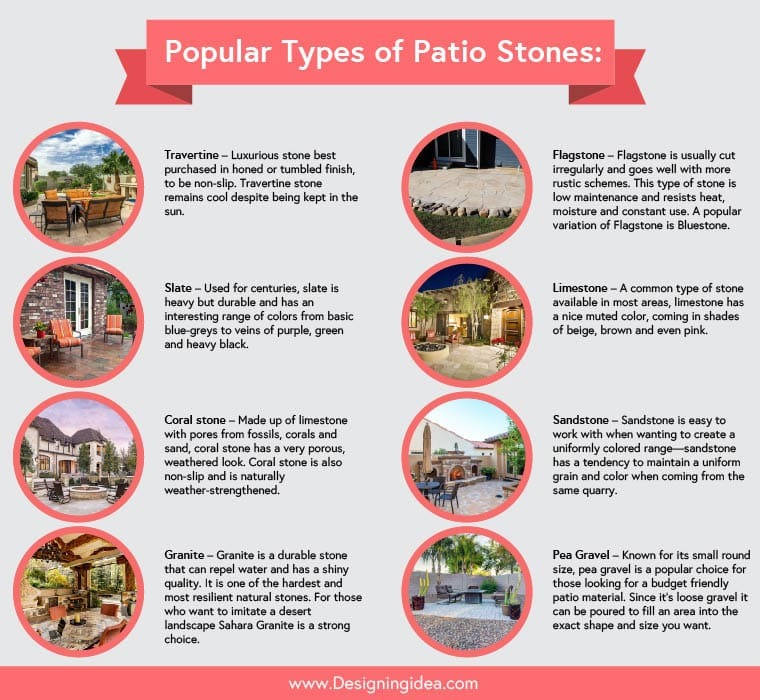 Below you’ll find tips and ideas for using different types of stone materials to create a gorgeous looking patio design you and the whole family will love. 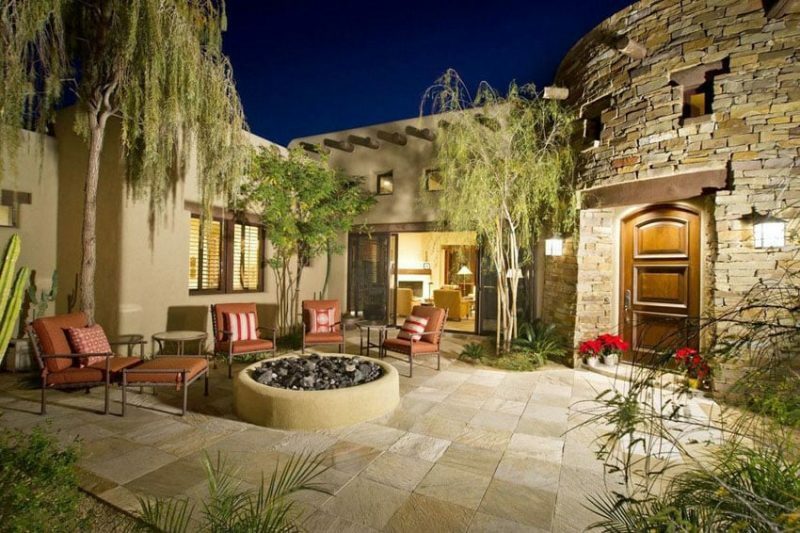 The backyard in the picture above features a raised stone patio with a small hedge wall with outdoor lamp lighting on its ledge. The floor is in an orange tinted flagstone arranged in a random course, while the wall features a combination of beige, brown and grey river stones stacked in a random configuration. The rich, warm tones of the stone used in the patio go well with the neutral brown clapboard façade of the house, and also goes well with neutral blue color used in the patio furniture. 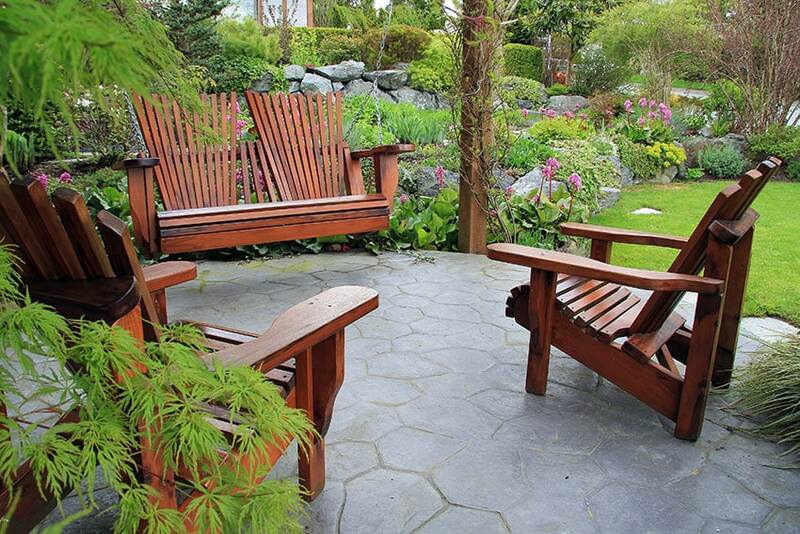 A beautifully landscaped backyard or front lawn is nothing if there is no deck or patio to enjoy the view from. One of the best materials to use for outdoor flooring is stone, not only because there are so many different varieties that can go with any house style, but because of its resiliency. Natural stone can be treated with a sealer specific to your chosen stone. This is important because the stone needs to be able to withstand weather, wear and tear and maintenance work. Travertine – This luxurious stone comes in a spectrum of colors from ivory to light brown and even gold. This stone is best purchased in honed or tumbled finish, so as to be non-slip and to create a more interesting flooring profile. In addition, this type of stone remains cool despite being kept in the sun. Flagstone – Known for its rich spectrum of earth tones from light brown to red to darker grey, flagstone is usually cut irregularly and goes well with more rustic schemes. This type of stone is low maintenance and resists heat, moisture and constant use. A popular variation of Flagstone is Bluestone, that shines with a natural blue-grey sheen especially when polished to a matte finish. Slate – Used for centuries, slate is heavy but durable and has an interesting range of colors from basic blue-greys to veins of purple, green and heavy black. Limestone – A common type of stone available in most areas, limestone has a nice muted color, coming in shades of beige, brown and even pink. Coral stone – Made up of limestone with pores from fossils, corals and sand, coral stone has a very porous, weathered look. Although perfect for patios going for a more tropical look, it can also withstand freeze-thaw cycles of colder climates. It is also non-slip even when done in a matte finish and is naturally weather-strengthened. Sandstone – Similar to limestone, sandstone is also a sedimentary stone that comes in a range from light brown to red. Sandstone is easy to work with when wanting to create a uniformly colored range—sandstone has a tendency to maintain a uniform grain and color when coming from the same quarry. Granite –Some of the best granite comes from Italy, like all granite it can repel water and has a shiny quality. It is also one of the hardest and most resilient natural stones, and is best when flamed, creating a porous natural polish. 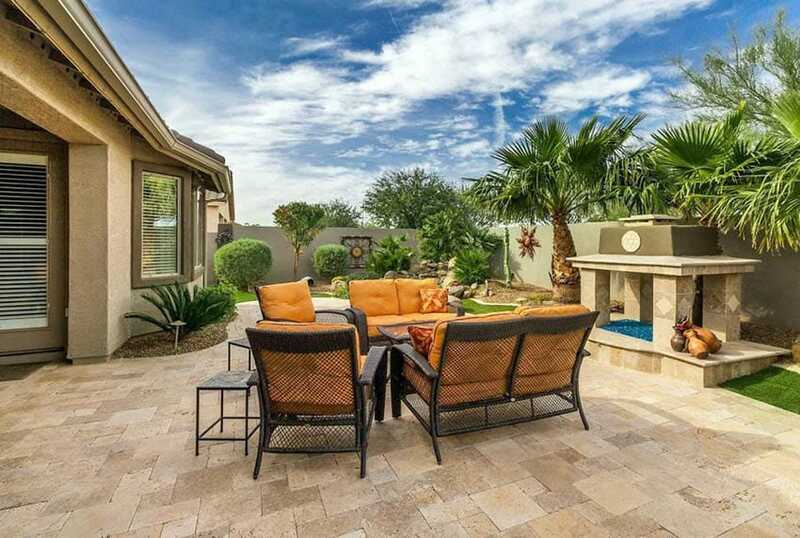 For those who want to imitate a desert landscape Sahara Granite is a strong choice. With colors such as shades of brown, tan, gold and black it makes an attractive and durable patio material. Pea Gravel – Known for its small round size, pea gravel is a popular choice for those looking for a budget friendly patio material. Since it’s loose gravel it can be poured to fill an area into the exact shape and size you want. Pea gravel is also available in a wide range of colors such as gray, blue, brown, tan, white and green. Pea gravel provides excellent drainage making it popular for those who want an inexpensive and low maintenance patio. Besides the stone used, it is also important to choose a layout specific to the design. Stone can be cut into small linear shapes to create a contrast between the natural stone’s different shades, or cut into large irregular shapes to showcase a large portion of the stone’s natural grain and veins. When wanting to go with more regularly shaped stones, some interesting patterns include Herringbone, Basket weave, random course, and Flanders weave. When wanting to create curvilinear shapes, Serpentine is the best layout, with its smooth undulating grade. When working with larger, irregularly shaped stones, Cobble, Flagstone, Keystone and Bush rock are good patterns to stick to. Although these all might seem like random patterns, these patterns dictate the gaps and starting stones when doing the layout. Lastly, to highlight a central portion, a rounded layout such as rosette, cobbled rosette and compass may be used. 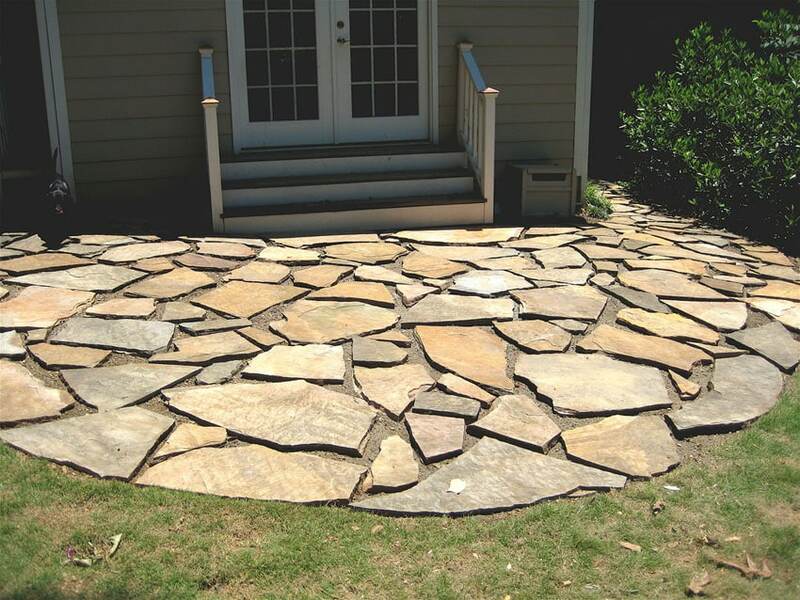 Below are a variety of stone patio designs in a variety of settings. You’ll find stone patio ideas for around the swimming pool, garden, terrace, courtyard, elevated backyard and more. This house, with its combination of clean, rounded whitewashed walls with a columnar built-up area of thinly-sliced split-faced sandstone, achieves a more Mediterranean feel. The patio flooring features clean square tiles in an unpolished limestone, a good base for the use of dull red cushions for the patio furniture. 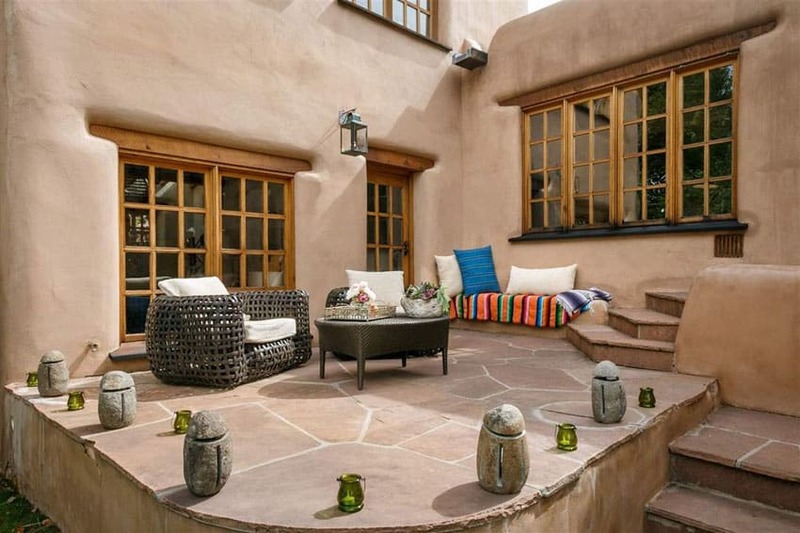 The center of the patio focuses on a built-up fire pit done in the same whitewash stucco similar to the walls of the villa. This Contemporary luxe home features a long, linear patio stretching from one end of the house to the other, and decked with furniture in light beige and dark brown, from coffee table sets to sunbathing chairs. The flooring is done in a large flagstone layout using fine-grained unpolished limestone. A low wall separates the patio from the pool and serves as small plant boxes. Although topped in the same large limestone, the vertical faces of these small garden walls are in a rougher, thinner, darker sandstone variation, which accents with the floor stone and the white walls and fascias of the house. 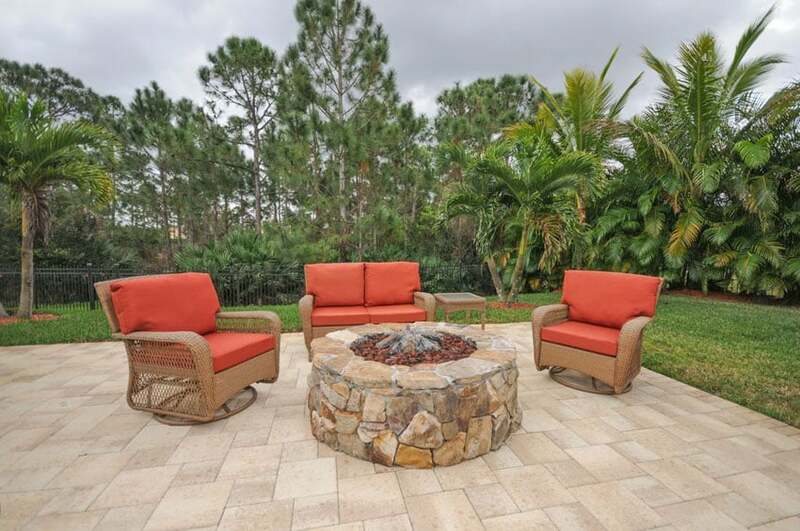 This beautiful backyard patio is constructed using travertine tile. With its neutral color this stone tile creates a natural environment that matches perfectly with a variety of design and landscaping styles. Travertine is extremely durable and able to withstand weights of up to 8000 pounds per square inch. 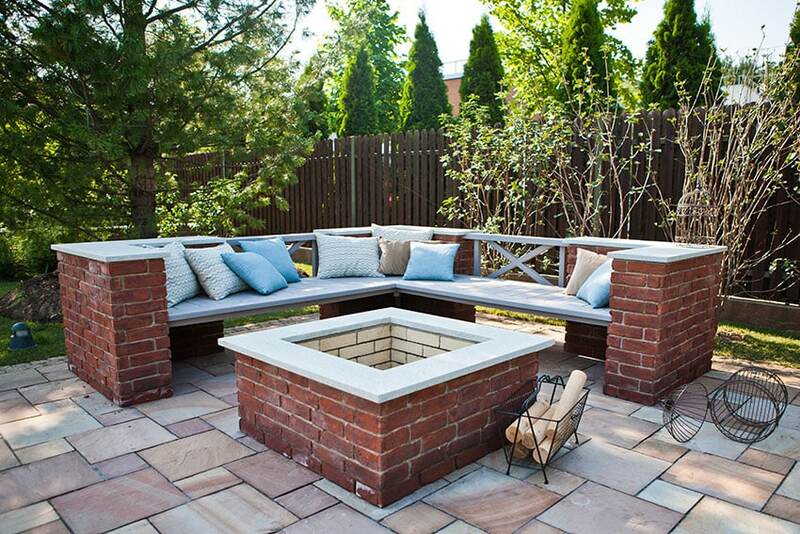 Although small, this Classic backyard patio manages to look warm and inviting due mostly to the built-up fireplace on one end. With three stone arches, some red and white rock is done up in small piles, backed by a tan-colored stucco wall. The flooring features small cut pieces of sandstone in different shades, set in a classic herringbone pattern. A small patch of green is seen via the elevated plant box with small tree and grass. 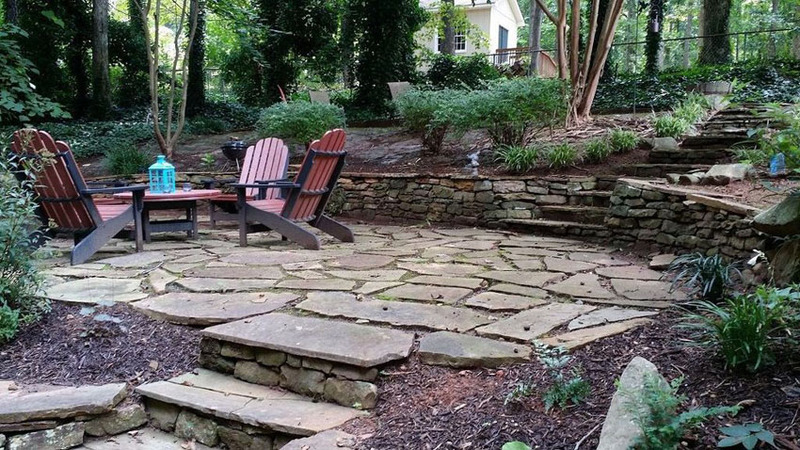 This old, rustic style backyard features a very natural looking patio with its large flagstone steps in a dark grey, aged cement. Retaining walls are also used for the terraced landscaping as well as stone steps, done in a mossy grey stone stacked in random courses. Some basic table and chair furniture in a warm red wood color sits on one side of the patio, matching with its rustic aesthetic. When searching for natural looking backyard stone patio ideas, the use of flagstones can give the design a natural look. 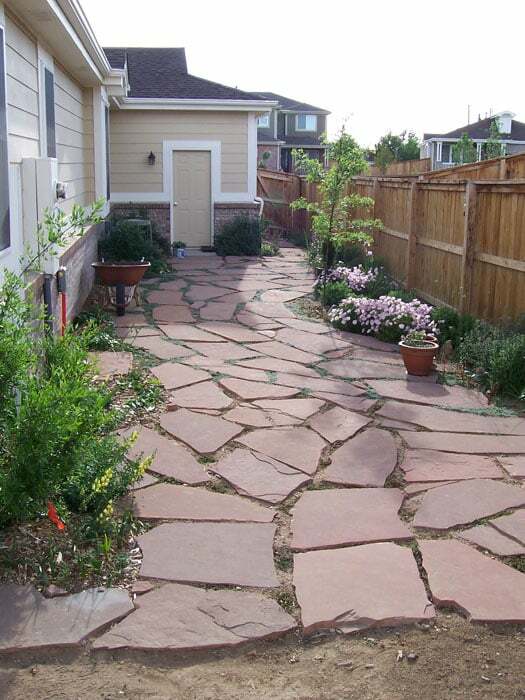 flagstones have appealing earth color shades of brown and red that create a very organic style. This Spanish style home features stucco walls in tan matched with warm wood door and window headers and mullions. The large set of French doors leads to the outside patio, which features rattan furniture in dark brown, as well as a small bay window to the side decked in blankets and pillows in vibrant prints. The deck is done in a rough sandstone finish cut in large flagstones, and bordered by rustic style stone lamps and glass candle holders. This country style villa features white walls and Classic interior seen through the large open doors. An exterior hallway is lined by columns done in a rusticated stacked stone veneer, covered in ivy, and flagstone flooring. 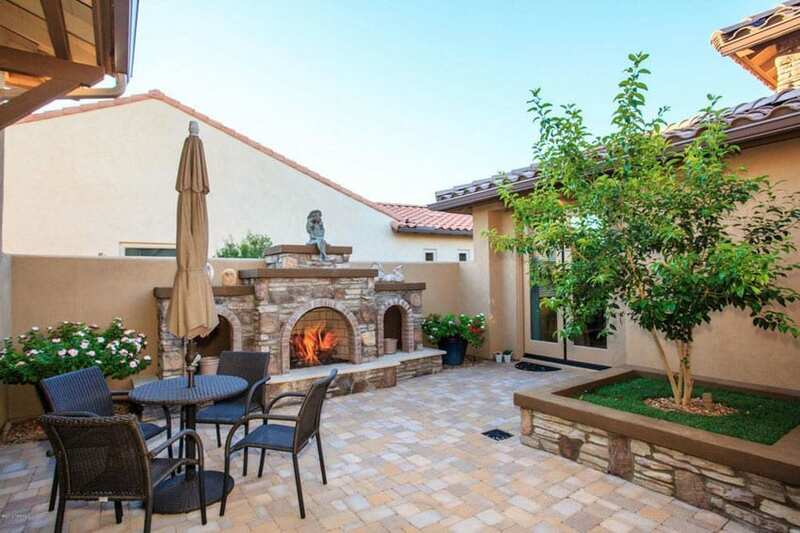 The open air patio features a round fire pit featuring the same stone veneer, while the flooring of this area is a plain, unpolished cement finish with stacked stone borders emanating from the central pit. Heavy rusticated wood furniture surround the central fire pit and are decorated with muted blue pillows. 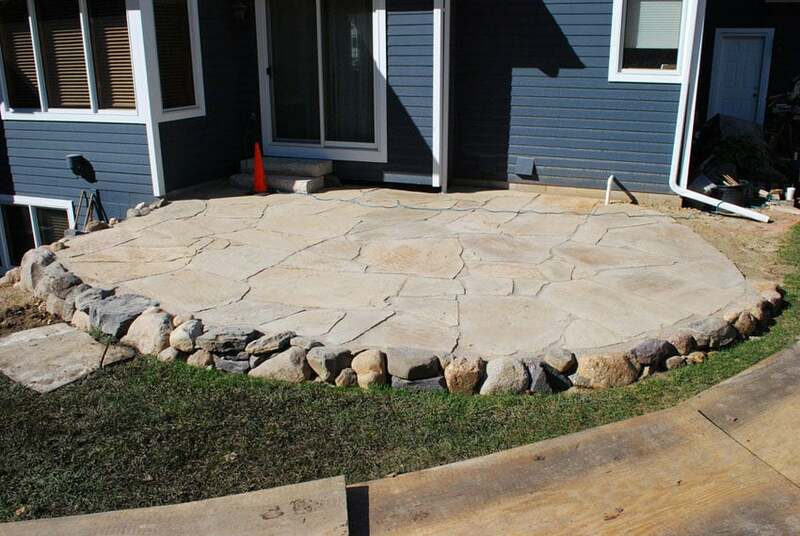 For a very natural-looking backyard patio, large flagstones can be spaced with larger gaps that allow grass and small weeds to grow in between and act as grout. 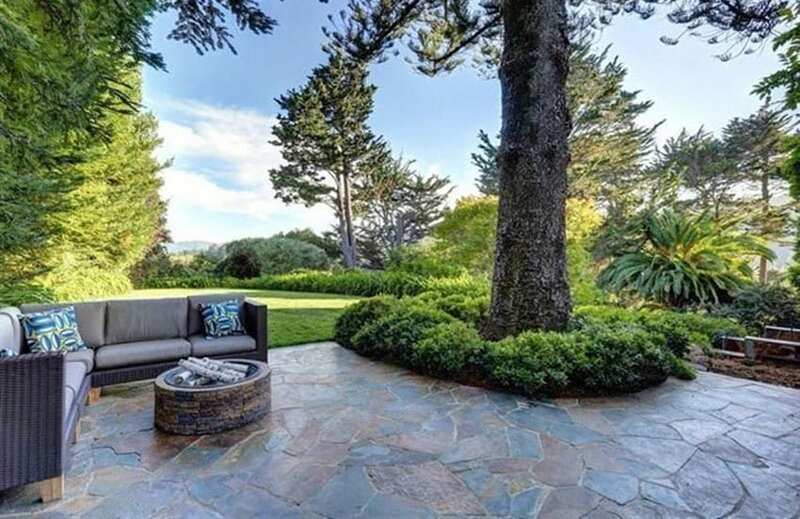 This backyard features such design and is highlighted by the excellent landscaping done in the area, from its potted plants, tall trees and wildly grown flowering vine over the gate’s portico. 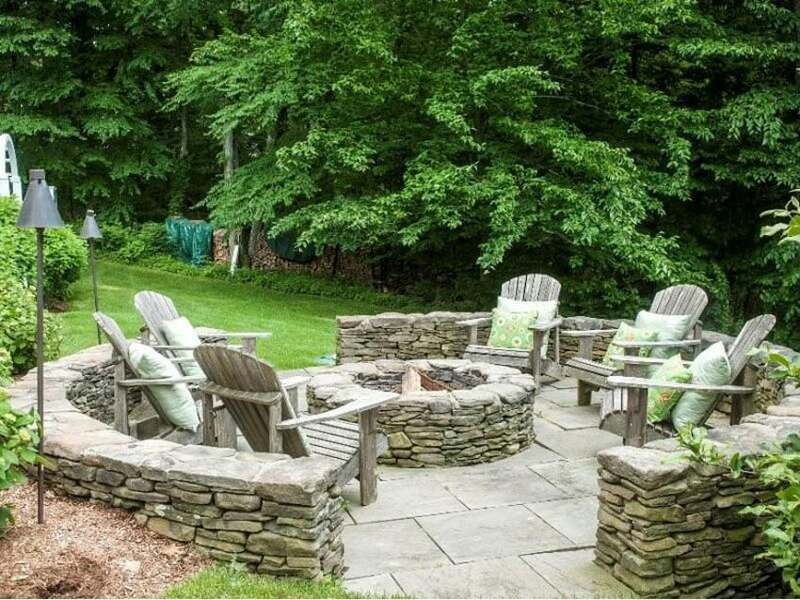 Situated on a grassy sloping terrain, this backyard patio features stacks of random coursed bluestone to act as its retaining wall perimeter, forming a circle with entrances on both sides. The center features a built-up fire pit in the same stacked stone, while the flooring is in an alternating pattern of square shaped bluestone. Classic lawn chairs in a weathered wood are decked around the fire pit and decorated with quaint green throw pillows. 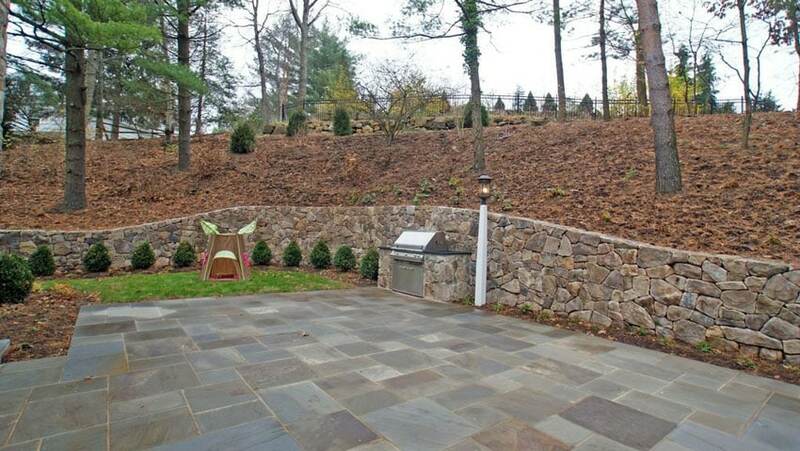 Dark grey, red and orange bluestone stacked in a random course act as retaining wall, as the higher part of the land slopes down to this Contemporary stone patio. 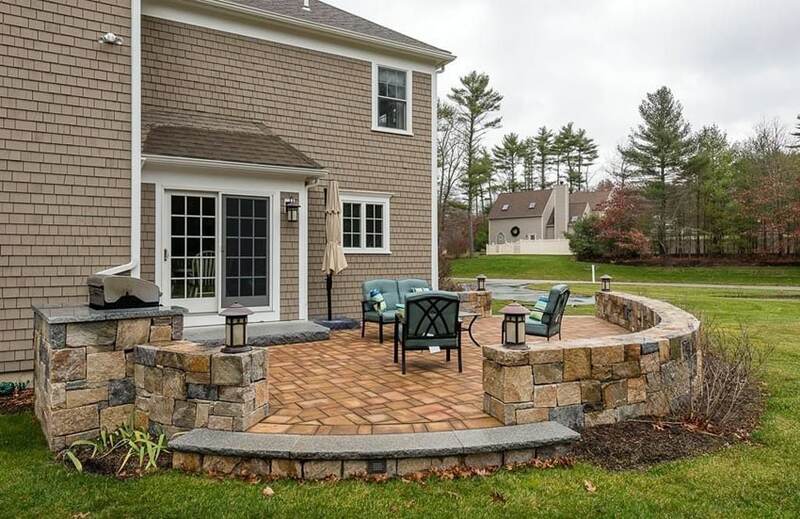 The patio floor features large grey and brown stones cut in rectangular shapes and set in a basket weave pattern, creating a very modern look amidst the autumn foliage and rusticated stacked stone retaining wall. 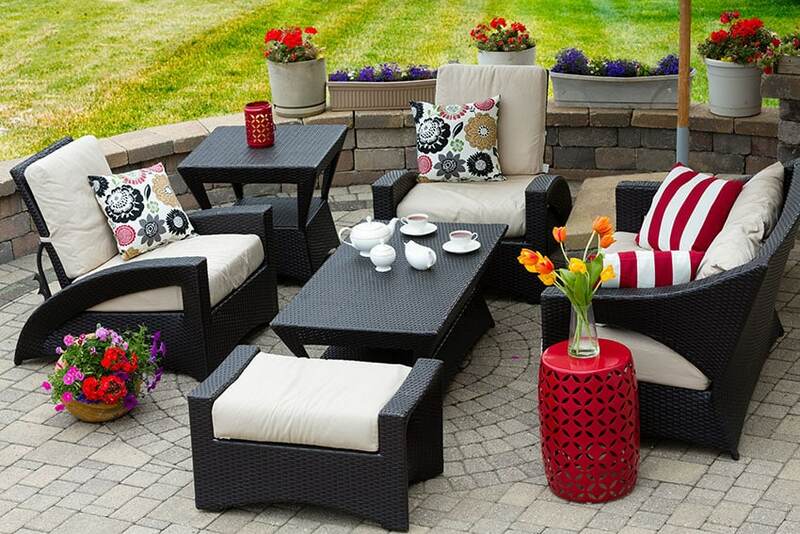 This Contemporary style backyard features bright vermillion cushions on the natural rattan finish outdoor furniture. This brilliant shade goes well with the muted orange-beige tone of the sandstone flooring, set in a random coursed ashlar pattern. 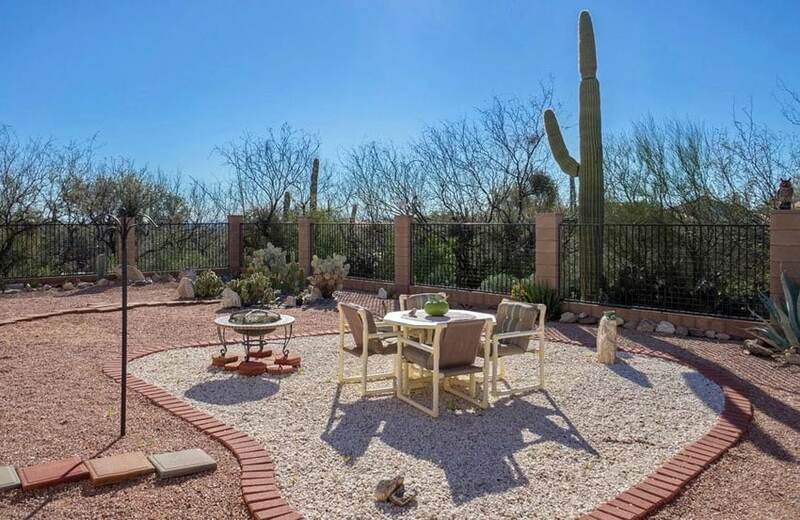 Random course stacked stones in a deeper sandstone finish pile up on the center of the patio creating a circular fire pit. The patio itself is surrounded by palm trees and pine trees, creating a tropical modern backdrop. 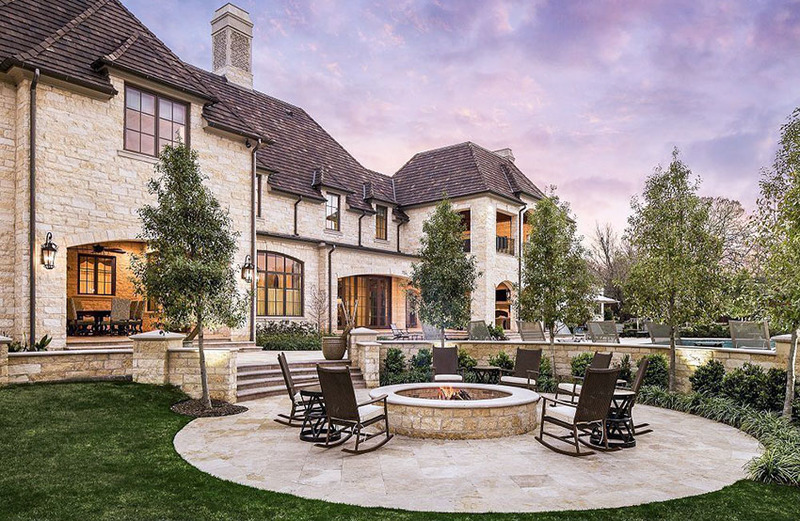 The circular patio design in square coral stone matches the luxurious aesthetic of this modern day Victorian style home, with its limestone brick façade and dark colored roof shingles. The center of the patio features a fire pit built up of split face limestone blocks, and is surrounded by dark brown rocking chairs. The surrounding circumference also features a retaining wall separating the patio from the pool, and a set of curved stairs built up in the same limestone blocks. Simple cement pavers, when laid out properly can give a backyard patio a polished, luxurious look. Here, small square cut cement pavers are arranged in a random course, bordering a cobble rosette in the middle, where the tea table of black woven rattan is centered. Surrounding the table are matching black rattan armchairs, stools and tables with plain white cushions and patterned throw pillows. The back wall, with its surface decorated with planters, is also built up from a simple cement brick in an alternating pattern. 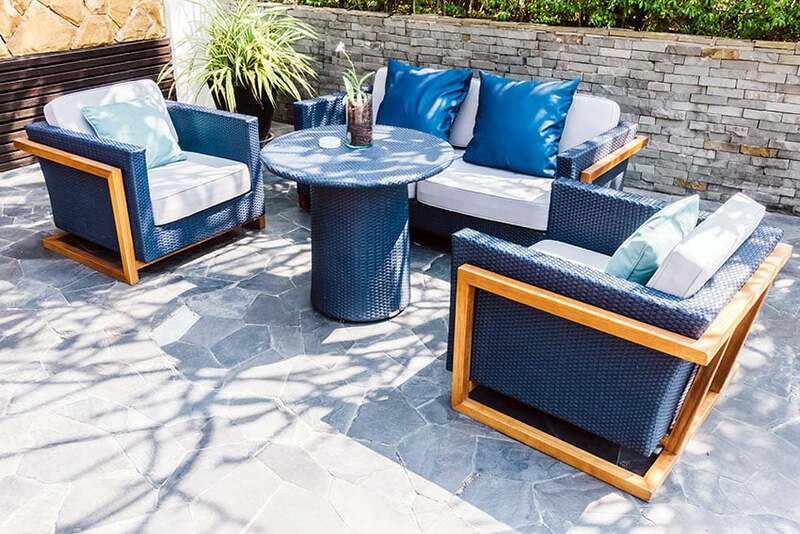 Cool grey bluestone cut into flagstones provides the perfect base for a vibrant blue rattan outdoor patio set with yellow-tinted wood accents for the framing. 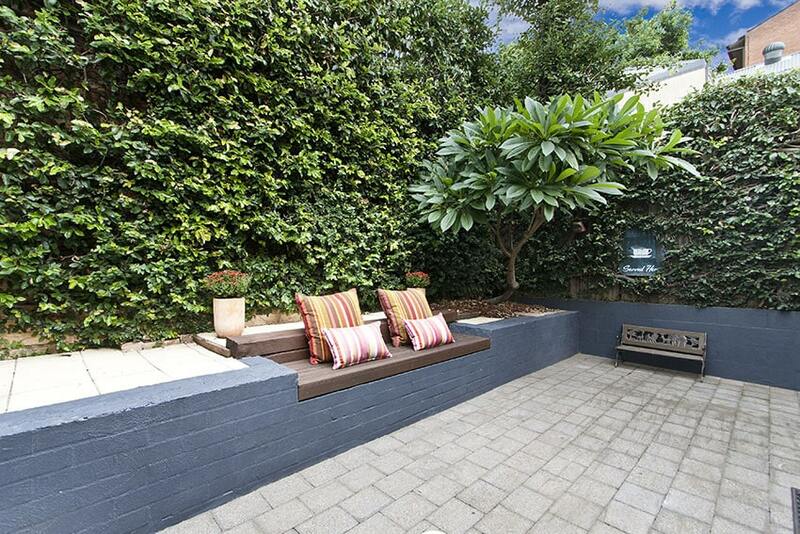 The set is topped with clean white cushions and deep blue throw pillows, and is bordered towards the back by a similar greyish bluestone in smaller cuts stacked up to create a plant box. 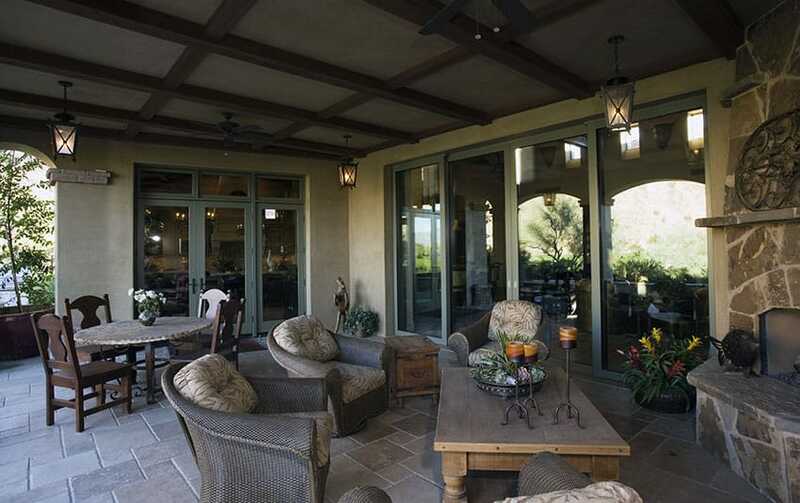 This covered outdoor patio emanates from two sets of full glass sliding doors to the main house. With a beautifully coffered ceiling and rustic hanging lamps, the random course sandstone tiles on the floor go with the classic luxe theme. Comfortable cottage style furniture, from the wood and stone dining table to the cozy cushioned rattan chairs and the reclaimed wood coffee table, litters the entire space. The cozy cottage feel is further emphasized by the corner fireplace built up in a dark, weathered flagstone spanning from top to bottom. This Mediterranean style villa features pristine white stucco walls and turquoise shutters that match the colors of the beautiful ocean view. This luxury look is emphasized by the local reddish terracotta tiles used for the flooring, done up in an intricate cobbled rosette with a cobbled fan border. The same stone tile is used for the ledge, which is topped with colorful flowers in clay pots. 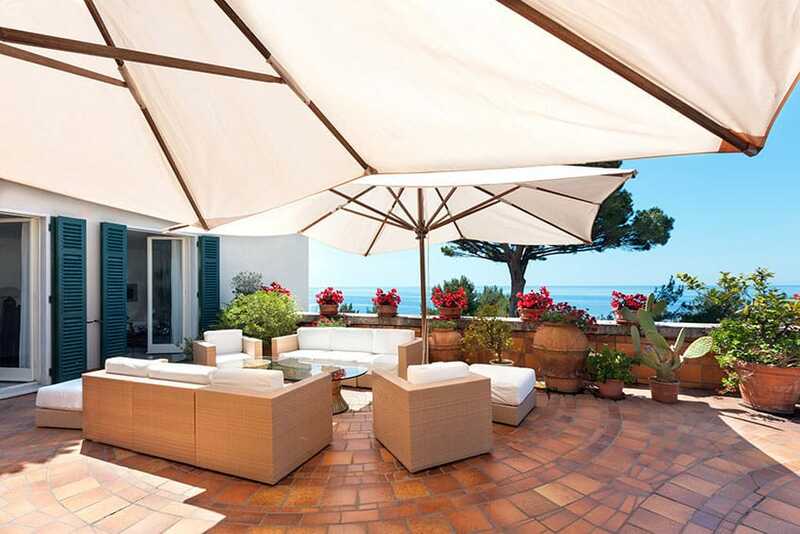 The deck furniture is Modern, woven rattan matched with clean white cushions and protected from the Grecian sun by large white floor mounted umbrellas. Using simple cement tiles in an alternating course for this backyard patio’s flooring, the design takes on a Modern Industrial look, matching it with a built-up platform made of brick painted grey. A small bench is recessed into the platform and topped with dark wood planks and decorated with striped pillows. The back wall has grown lush with wall creepers, creating a beautiful green space without needing to maintain a difficult and costly lawn. A cheap alternative to hauling and importing natural stone, poured concrete can be done up with bordering lines, such as this backyard that decided to go with a rough hexagonal type shape. Non-slip and easy to maintain, the grey coloring allows the redwood lawn chairs to really pop and provide color. It is also a great base to a well maintained lawn and garden overflowing with flowers. 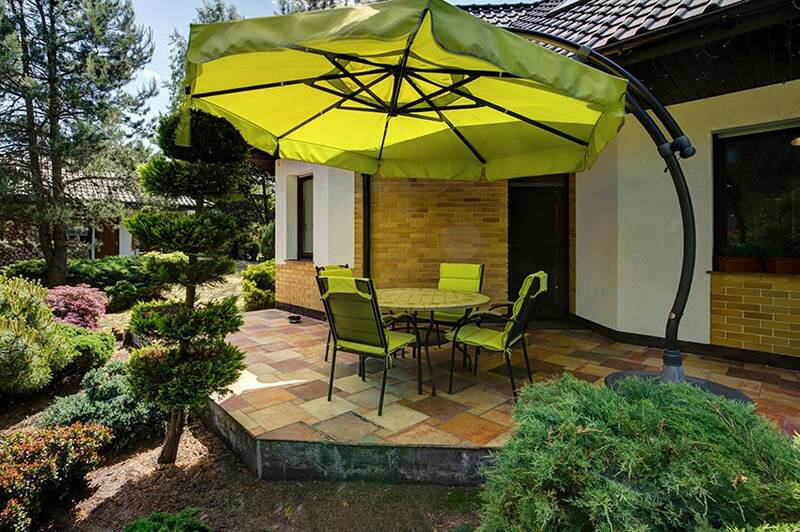 A large fishpole type umbrella in canary yellow shields a patio set in black iron and matching yellow cushions. This quirky modern look matches the clean white walls and black clay tile roofing of the house. The ornamental plant landscaping further emphasizes the modern design, while the red and brown random coursed stone flooring and sandstone brick walls give it a more Classic touch. 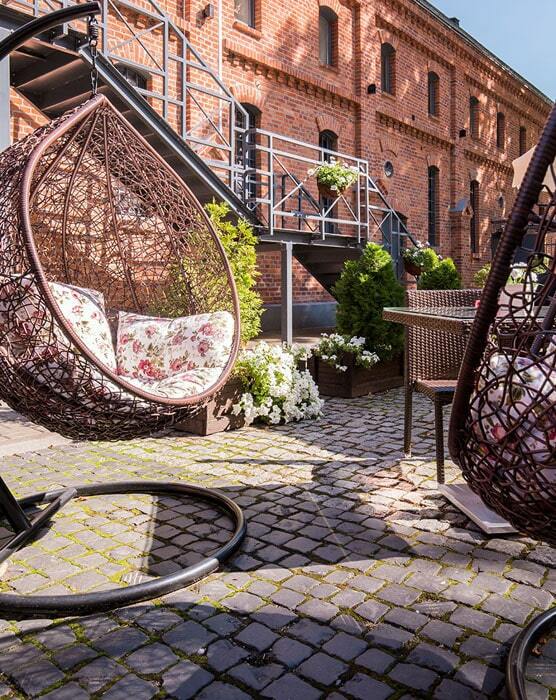 Woven rattan hanging egg drop outdoor chairs give this backyard a Contemporary rustic feel, especially as it is matched with an apartment building in vibrant red brick, and a steel staircase leading up to it. The ground cover is done in a simple cobble stone with gaps for grass in between. The landscaping of the area features common flowers placed into large dark brown crates, matching with the outdoor patio set. The fine, strong grain of this backyard’s sandstone tiles match the deep hue of the red brick used for the firepit and built-up bench. Done in a classic herringbone pattern using clean cut stones, the flooring goes up to the edges of the patio, bordered by trees and lawn. The built-up fireplace is topped by a white painted rim, similar to the topping of the brick built-up bench. The bench also features white painted wood cross bracing, and is decorated with pale blue and beige throw pillows. This easy to construct pea gravel patio with red brick border makes a fine place to set up an outdoor dining table to enjoy the outdoors. A portable fire pit makes a great addition to enhance the ambiance at night. 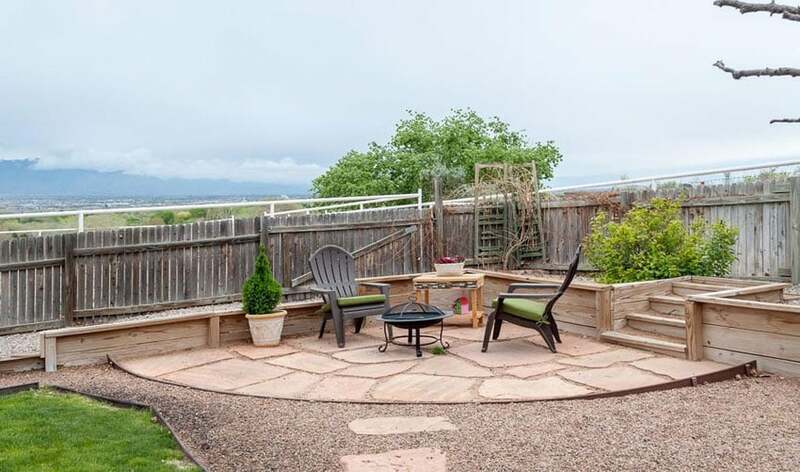 A small pile of cobbled grey and brown stones provide the perimeter for this backyard patio, done up in large reddish brown flagstones and arranged in a rough circular layout. The rusticated look of the stones goes well with the strong dark blue color used for the house’s horizontal sidings and clean white trims. 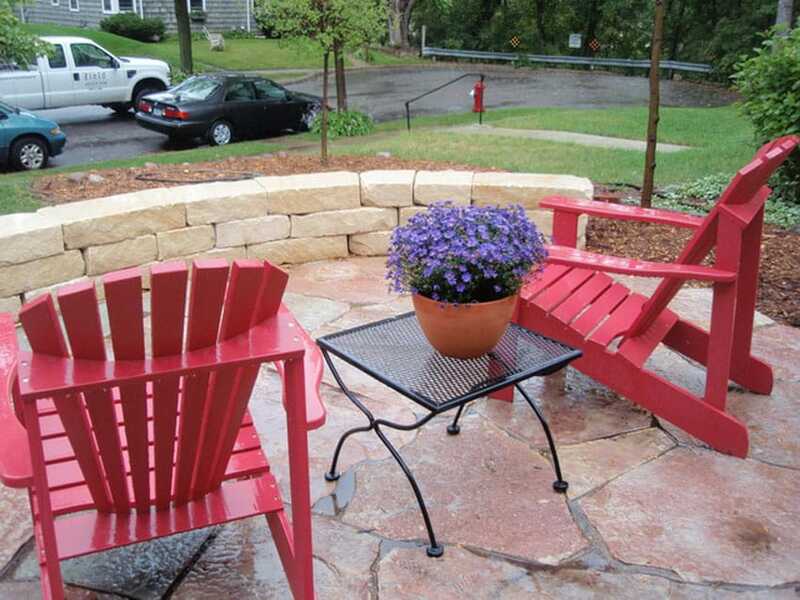 Although no grass has yet grown, the large gaps in between these reddish stones laid out in a flagstone pattern encourage the natural growth of grass or weeds. Creating a semi-circular space, the patio leads in directly to the Classic ship lapped house via a small set of steps and a pair of white mullioned French doors. Going for heavier colors that match the beautiful cherry tree in the backyard, the house’s walls are in a strong red brick color, broken up only by the off-white French door leading to the outdoors. 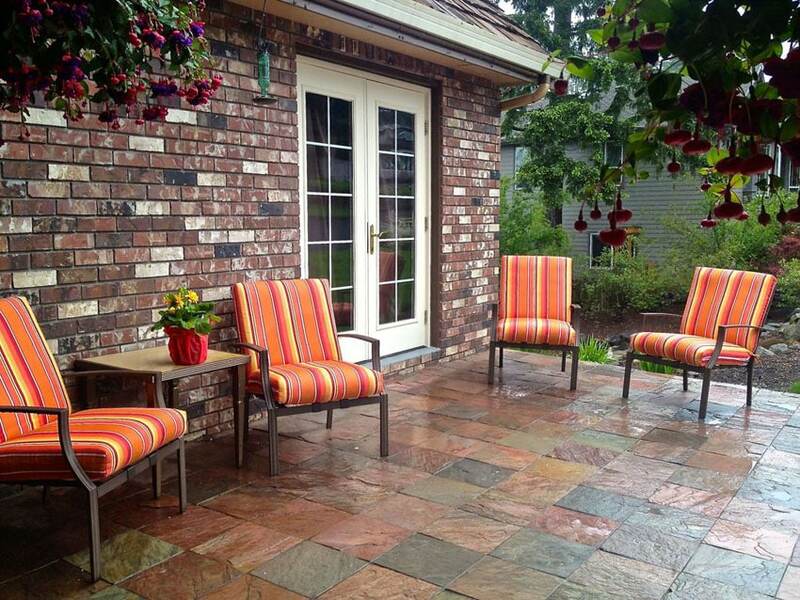 The outdoor patio also features some vibrant orange patio furniture over traditional square cut tiles of slate in shades of red and black. Tan-toned stucco perimeter walls create a background to the black painted wood pergola over an outdoor couch in muted tones of grey and beige, decorated with brown and beige pillows. The flooring features slate tiles in orange and grey, cut into small stone tiles and set in a linear pattern. 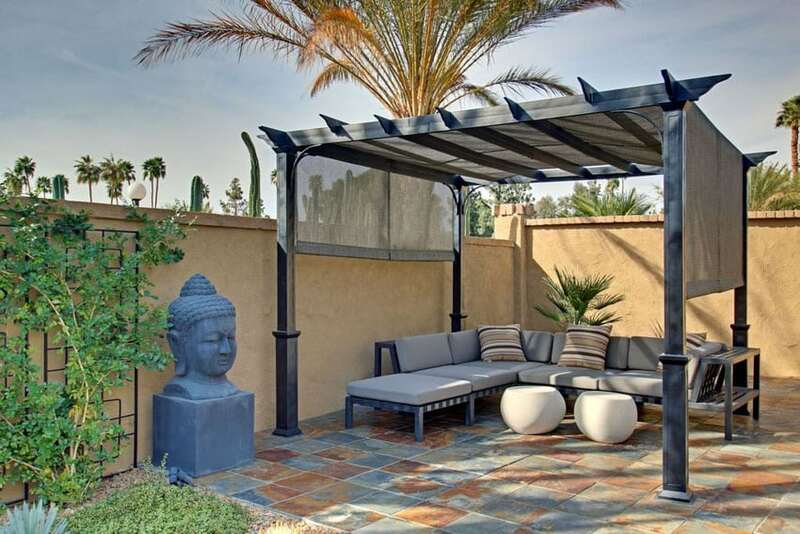 The Buddha bust statue and crawling vine frame give this backyard patio a tropical Asian style. Backyard stone patio ideas that overlook a water feature can provide a relaxing ambiance that are appealing to the senses. This design of irregularly shaped grey slate stones creates a small outdoor patio next to a small flight of steps coming from the wooden deck. The grey stone contrasts well with the warm wood used for the balcony, as well as the autumn grass and foliage around it. Beside the patio is a landscaped rock garden with bubbling stream and a small lawn. 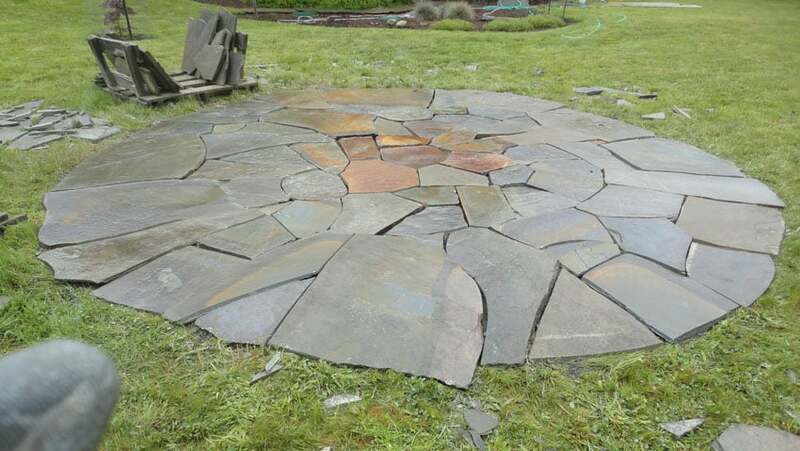 Random cut slate stone in dark grey and orange tones are arranged into a circular formation, providing a very rustic patio on a large backyard lawn area. Surrounded by grass, this type of layout provides a good place to hold a small backyard party amidst the lawn and landscaping. This Classic cottage home features stacked stone veneer walls coming to midway of the house’s walls and culminating in ship lapped boards on its exterior. This quaint housing style goes well with the large random coursed flagstones used in the garden patio. 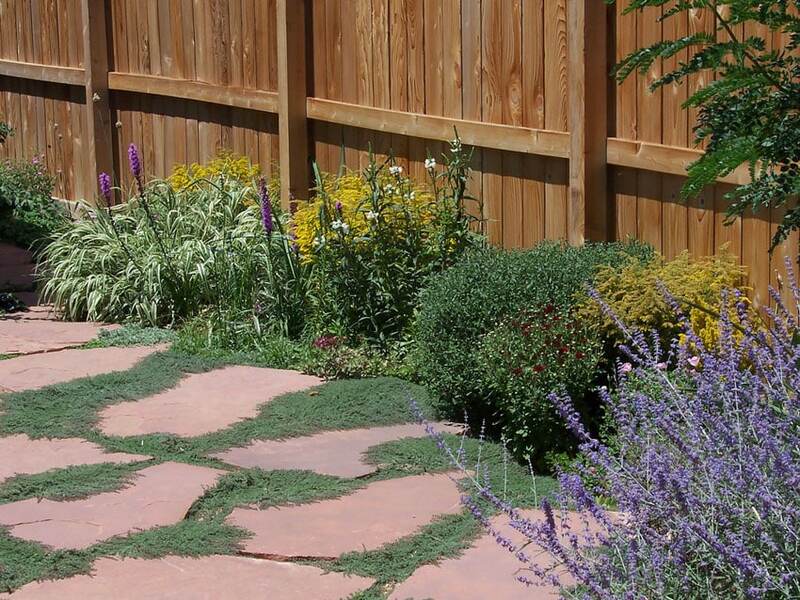 In between the large reddish stones, grasses are allowed to grow, as well as low, flowering bushes on its perimeter. A simple wooden fence in a warm tone lines one side of the patio. Large unpolished flagstones are overrun by the natural growth of grass in between the reddish stones. Yellow and lavender blooms also cover its perimeter, and their color is further emphasized by the simple wooden garden fence done in a rough-grained warm wood tone. Classic style lawn chairs painted a vibrant red create a warm welcome in this entrance patio, especially when decorated with a burst of lilac flowers on a Classic style wrought iron table. This quirky Classic look is further emphasized by the large polished flagstone flooring in warm maroon tones. A short garden wall in a random course of limestone blocks creates a circular space for the patio and separates it from the front lawn. Built around a large pine tree, closely spaced slate flagstones in deep greys and orange creep right to the trees roots, surrounded by a low growing leafy bush. 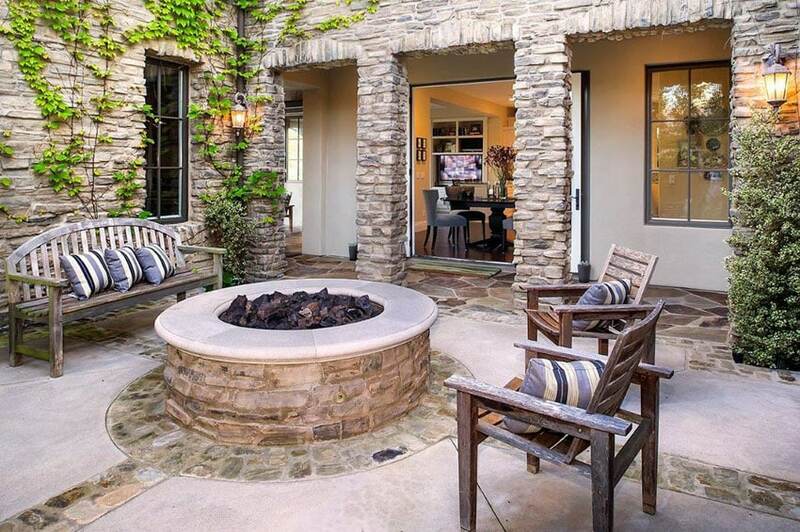 To the side, a small fire pit is built up in smaller split stone cuts of the same slate finish, and is bordered by an L-shaped sectional sofa of dark brown rattan. The sofa is decorated with muted beige cushions and geometric throw pillows. 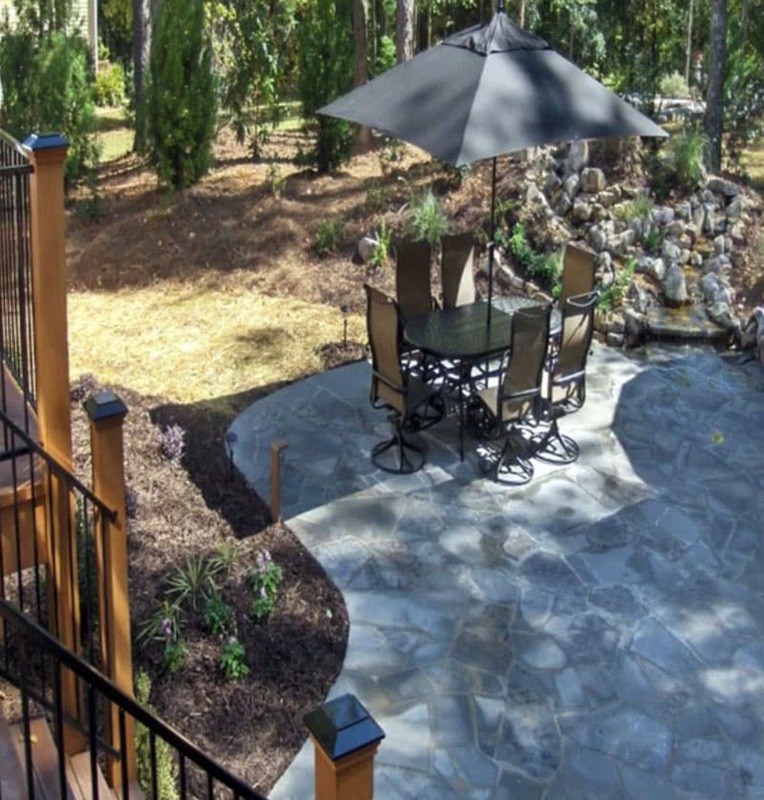 This backyard stone patio goes well into the woods, being a small distance away from the house and completely covered by a thin canopy of trees. 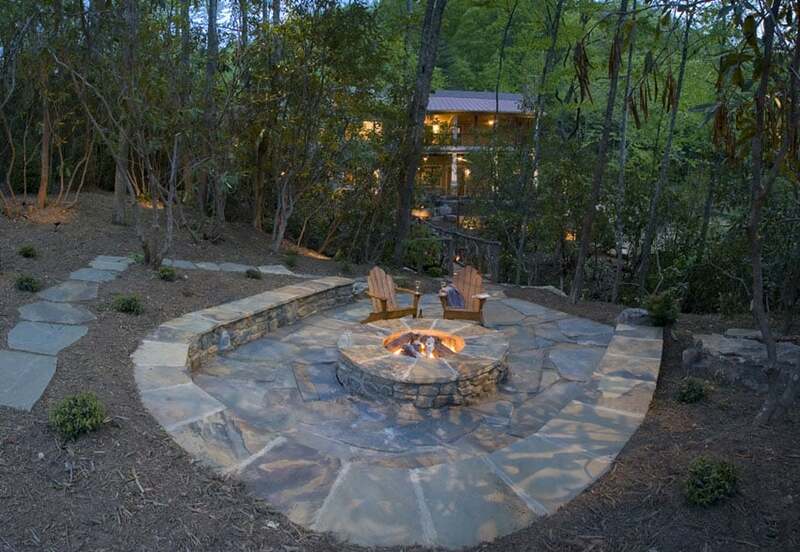 Built into a dugout of the slope, the patio is lined with large stone blocks in a circular bench layout, with a central fire pit in the same stone finish but in smaller cuts. Some irregularly cut stone slabs in the same orange-grey tone are placed in a line to the side of the patio leading to the main house. A small circular patio in large reddish flagstones is laid on the corner of a weathered wood fence. This rustic style backyard patio also features a lighter reclaimed wood for its retaining walls and small steps leading to the patio. Adorned with simple plastic lawn chairs in dark brown, scattering pebbles on the boundary before the lawn adds a bespoke touch.